WOW! if only I had the space for one of those beaut’s. Now THAT is how you make dirt! It is reassuring to know that there are some who are finding and showing the way to sustainable existence. The audience may now be small, but circumstances will change. And composting is a most important (but until now, in the non-sustainable mode, neglacted) step in completing the cycle of sustainability. 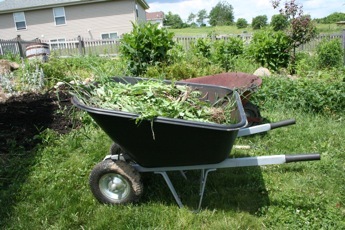 You got the wheels spinnin’… I’m currently redesigning my compost bins (how DO they fill up so fast?!? 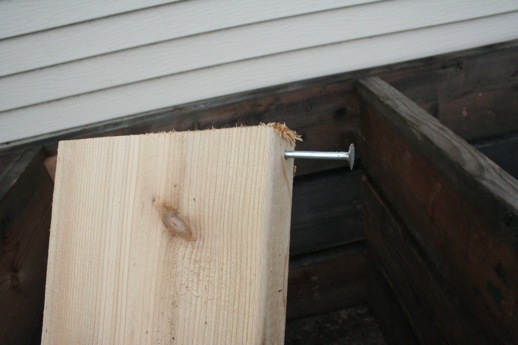 ), and while I’m trying to watch the budget I’m trying to stay away from p/t lumber. Reclaimed lumber like that hadn’t occurred to me- there are enough salvage yards around that I’m sure I could snag some. Your setup looks great- why underbuild when you can overbuild? Thanks everyone, I have been dreaming of this system for years! I now have a 5 x 20′ area of my lawn devoted to soil making, and another almost 500 sq feet in green manure crops to feed to the bins. Glad to hear that this inspired some people -it too came from an inspiration from a home I visited on a rain barrel delivery -they had a 3 bin system made from decking that looked uber stout -I just happened to come across these behemoth boards for a song so now my bin can double as a storm shelter -and given the weather lately in the upper Midwest that is not a bad thing! I Feel you pain. Not top soil in here. Some people do not understand why people in HOA only have some raised beds and a lot of grass. It is very expensive and takes a lot of time to get good top soil. I am new to the whole gardening and composting experience, and I am planning on building a similar set up. Are you going to use this for hot or cold composting? I have read some designs that lift the bin off the ground in an effort to allow air circulation from underneath to get into the heap, do you think this is worth the effort? This set up is for hot composting -I leave one bin empty and that allows me to have an empty onto turn the others into -basically one of the end bins is always empty as I rotate the full bins left to right. the system would work just as well for cold composting, like leaf mould or whatever. I always leave my beds in contact with the soil -any design that would let air in the bottom, would also let finished compost sift down, creating a maintenance headache. I do not think it is worth the effort -a yard of finished compost weighs over 600lbs so the floor would hve to be uber stout and it would add significantly to the expense of the bin: 20%+ for not much gain -if you are turning weekly you do not need the air flow. Also, soil contact is a create source for compost bugs, bacteria, and fungus. Actually I have been know to keep a compost bin over an area I want to turn into a garden in 2-3 years and use it to kill the sod and enrich the soil. can you help me figure out the movement of your compost ingredients? you have four bins, and say you use them left to right, So if you started out, your bins being A,B,C,D, left to right. When A is full to turn into B, or are you turning it into B and then back to A while filling? I picked up several pallots from craigslist and bought some really long tie wraps. Right now I have two bins. one is entirely empty, but if I wanted to turn the compost, since it’s only about 2′ high, it’d be back and forth A to B, B to A, etc. I get the First in First out thing, (I think!) 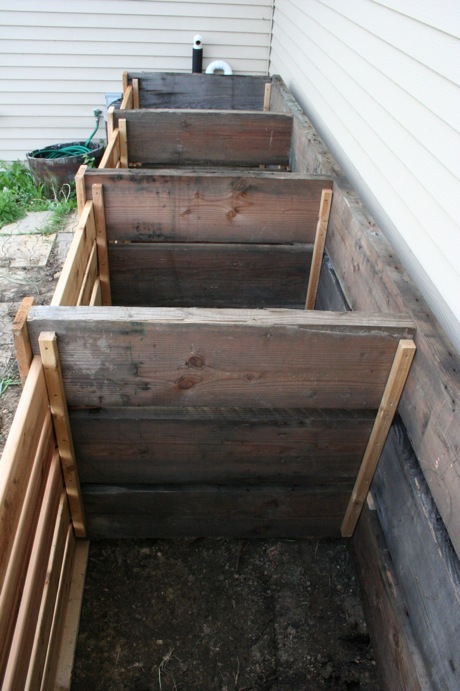 so since you have one always empty, it seems you’re getting finished compost fairly quickly! I’m structurally ready I think to ask at least one neighbor for their mowed/mulched Fall leaves. QUESTION: I want to save some mulched Fall leaves to help layer wet stuff the next season, would you recommend mulch into black bags? and then keep pile by my bins? PJango, Sounds like you are onto a great project! Bin C: Compost that is mellowing (I actually have added red worms to it from the vermiculture bin as it no longer heats up at all (its done). The decision to turn is based on the temp of the “active” bin (Bin B). When it drops below 120 it is time. All bins then shift towards the empty bin (Bin C goes into D, etc) until Bin A becomes the empty bin. After a few days the “active bin” heats back up and a week or so later it cools down again and the process shifts again. Turning weekly typically produces material in under 3 months in my system. Depending on the amount of material I have, I may have 2 empty bins (early summer), or two active bins (Spring and Fall). The bin (C) that is in a worm holding pattern will go onto the tomato and veggie bed in a few weeks, and that extra empty bin will allow me to continue to take material from the coffee shop all winter. Leaves are great to store for next season. If possible try to reuse the bags again after they have leaves in them. I have found that leaves tend to mat fairly bad – if possible break them up as much as possible by running them over with an electric mower or something to break them up. Straw also works great for carbon in piles. If some of your neighbors use bales for decoration, ask if you can have them when they are done. so my 2’pile I’m building isn’t active, I’m guessing. I set it up about a month ago, and spent some time figuring out where to put stuff. I realize that since I typically leave lawn clippings on the lawn, I’m mostly adding greens to the pile. that’s the reason for saving some mulched leaves from previous Fall. (I’m in zone 4). to clarify, you still only add to a new pile, you don’t introduce anything to the others, in process? then A is always going to be your bin you add to, regardless of where the other stuff is. I don’t figure out how you’re taking from C before D? Here’s what I’m figuring for the winter: assume that I’m utterly lazy enough to not boot up and tromp to the compost bins! keep kitchen waste in current pail, when full, transfer to five gallon bucket held attached garage. lid as needed (it’ll be COLD), when full, push aside and start another pail. my thought is that come spring, I’ll have alot of frozen kitchen waste to plop into the compost pile, layered in all those HELD OVER BAGS OF MULCHED LEAVES/. straw is great, I have to be careful as I have a BEAGLE who loves to litter the back yard with straw and sticks and such, so if she sees it, she’ll go nuts. thanks.feel free to volly back any concerns of kitchen waste hold over. summer months when I can keep really current I just blenderize the stuff into liquid mulch. also getting coffee grounds at the coffee shop. 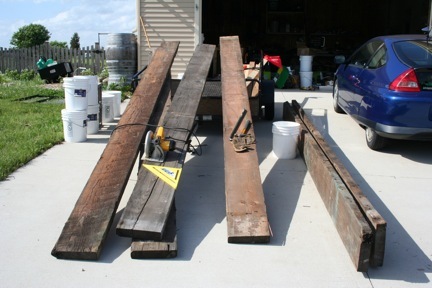 Getting reddy to build one and it is going to be lots like it. Should I have a roof on it? Im in the west. Washington, Kennewick..we get all 4 seasons and can get to -10 below but not common. We get snow, but Chinook winds usually melt away in a few weeks. Whats this GORP? Is it just the grounds and do I just put it in the compost pile with the green layer? I told my mom I was going to make a composting bin and she said not to put it near the garden where I wanted to put it due to the smell. AS long as They are taken care of they dont smell much do they? 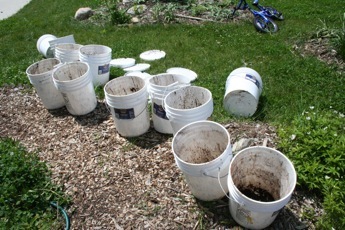 I usually do not put lids on my compost, but the top layer also dry outs fast then inthe summer. In August I often put a hat of 6″ of damp straw on it to keep it moist and out of the sun. If you have a Full Sun site, then a lid may be needed -mine is on the north of my garage, and only gets about 3 hours in the uber late afternoon. Compost bin hibernate under about 40 degree sustained. It is possible that this bin will have the ermal mass to sustain heat through Christmas, but I doubt it. One of the reasons I have 4 bins is so I can keep adding all winter when it isn’t breaking down. The Gorp is the slop buckets from a local sandwich/coffee shop. Tea bags, LOTS of coffee grounds/liners, banana peels, apple cores, lettuce heels, etc all go in. It is often rank and anerobic when I get it, but that dissapates. Other than the first time I build a pile, I don’t pay much attention to grren/brown layers – I just through in what I have and eyeball if I think the pile needs more “green” or “brown” as I go. Coffee grounds are very slow to breakdown (they’re roasted) so they act almost like a mild carbon. 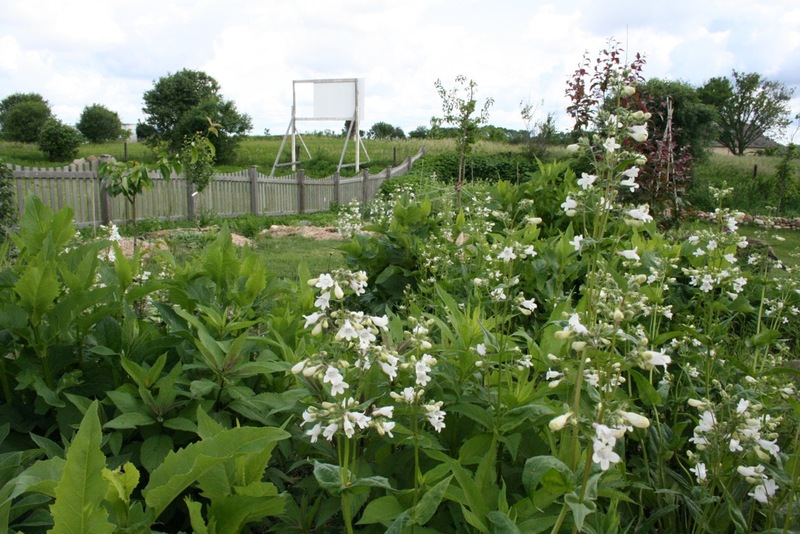 Typically I need to add greens to offset this -I keep a large patch of Russian Comfrey and Red Clover for this. A good compost bin that is well managed will not smell. Mine only smells when I turn them, but if I paid more attention to carbon ratios they wouldn’t smell at all. It is not rank -that would mean the pile was too wet or had waaay too much nitrogen, it is just stale and just short of unpleasant. If you are diligent about adding carbon with your greens you should be fine. Keeping it by the garden reduces labor by shortening trips, and any nutrients that leak out the bottom (alot does) can be used by the plants near the bin. Put a Zucchini over by it -it will be a 4′ shrub!